Lake Neusiedl, called the Neusiedler See in German, is Europe’s second ­largest steppe lake.The lake is an ideal breeding ground for hundreds of bird species, as it’s ringed by a wetland area of reed beds where the birds make their nests. The lake’s water is relatively shallow, meaning it gets warm quickly in the summer when it is enjoyed by birds and people alike. During the summer months, thousands of tourists come to the lake for sailing, swimming, and windsurfing. The best swimming beaches are on the eastern side of the lake, and the reedy western shores are best for bird­watching. The Neusiedler See is not just popular among watersport enthusiasts – the area is also wonderful for cycling, too. In addition to the athletic attractions, some of Austria’s best wines are made in this area, and the Neusiedler See National Park’s flora and fauna can be accessed and admired through solo exploration and guided tours. 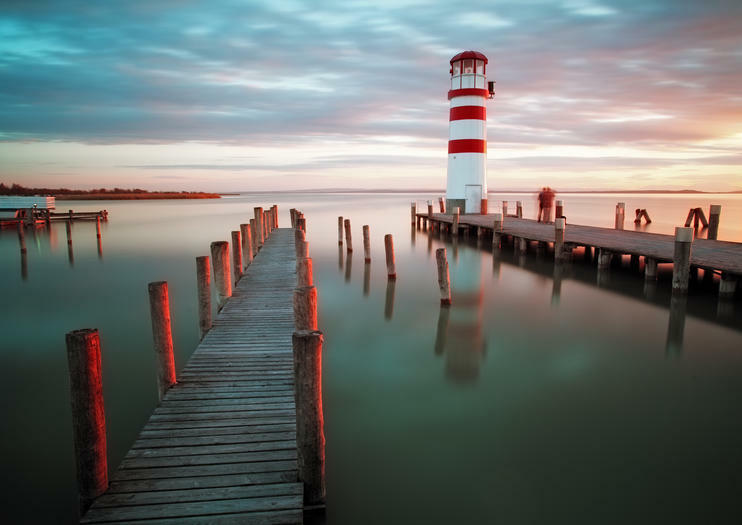 Neusiedl am See is the region’s largest town, the most accessible from Vienna, and a good springboard into the lake area. A bike path goes around the entire lake, the ferry boats that cross the lake will carry bicycles, and the hotels around the lake are almost all cyclist­-friendly (some of them even have thermal spas! ).